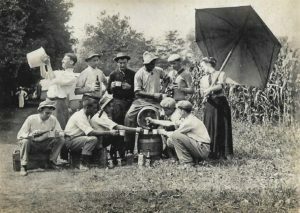 The Cardinal Athletic Club of Cumberland was founded in 1907 by a group of ten teenage boys, and was devoted to camping and other outdoor activities. The club had social and meeting rooms in Miller’s Dance Hall, in the rear of N. Centre Street between Frederick and Bedford Streets. Many of the area’s finest musicians were members. (For more information about the Cardinal Club, see the Whilbr page. Braddock Maryland Rye, distilled in Cumberland by James Clark, was “the finest all-rye whiskey in the United States”, (according to a 1910 advertisement). There were dozens of whiskey distilleries in Maryland in the late 19th and early 20th century, and Braddock was by far the second largest. Maryland distillers have recently revived the art of creating rye whiskey, and several will be offering tastings and bottle sales at the George Washington Whiskey Rebellion Fest, brought to you by the Community Trust Foundation. The Fest opens on Friday June 8, 6-10pm at Allegany Museum, 3 Pershing St Cumberland. The Fest is Allegany Museum’s major fundraiser. A ticket to the Fest entitles you to sample offerings from a dozen whiskey, gin, brandy and vodka producers, and craft beers from Terrapin, Dogfish Head, Antietam, and Stone. Bottle sales will be available. You will be able to participate in live Colonial games, mingle with re-enactors, get souvenir photos, and take home a goody bag. Enjoy the open beer and wine bar, and continuous delicious canapes by Good Carma. Only $50 per ticket ($75 at the door). Purchase by clicking here, through the Whiskey Rebellion Facebook page, or at the Book Center, Cumberland, or Main St Books, Frostburg. ← Find Dad’s Hat at the 2018 Whiskey Rebellion Fest!